What do drones and artificial intelligence have to do with farming? This week on The Produce Moms, we continue our adventure inside the Blue Room at FFA Convention. 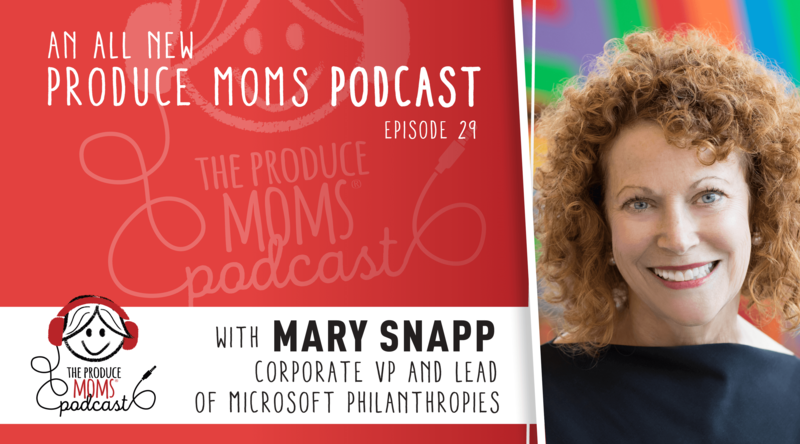 Lori and Mary Snapp, Corporate Vice President and Lead of Microsoft Philanthropies discuss how the advancement of technology is benefiting agriculture in a phenomenal way. Microsoft Philanthropies is focused on advancing a future for everyone, making our farms more sustainable, productive and regenerative. Agricultural careers are one of the top fields affected by the advancement of technology. Listen in to hear how agriculture and technology have grown together, and the impact that women have gained as these areas have evolved! The Philanthropies division of Microsoft reaches far beyond FFA. You’ll hear about their impact in local schools, how they are influencing the technology of tomorrow, and how their generosity provides food, technology and healthcare for the impoverished today. Preheat oven to 375 degrees. In a medium mixing bowl, stir together granulated sugar, cornstarch (For fresh rhubarb, use 2 teaspoons cornstarch, for frozen rhubarb use 3 teaspoons) and cinnamon. Stir in rhubarb, blueberries (or peaches) and julienned basil. Transfer fruit mixture to a 2-quart baking dish (10-inch pie plate or an 8-inch square pan); spread evenly. Set aside. For topping, in a medium bowl stir together flour, oats, brown sugar and salt. Sitr in melted butter or margarine. Sprinkle topping evenly onto the fruit mixture. Bake in the oven for 30 to 35 minutes, or until the fruit is tender and topping is golden brown. If desired, garnish each serving with a sprig of basil. Serve warm. Preheat oven to 350 degrees. Mix boiling water and oatmeal, and let stand for 30 minutes. Cream together brown sugar, shortening, white sugar and vanilla. Add two eggs and beat well. Add oatmeal mixture. Stir in flour, baking soda, salt, nutmeg and cinnamon. Turn out in greased sheet pan and bake for 45 minutes. Mix topping ingredients and spread evenly on the warm cake.